I will try to offer my available seeds in a better organized way. This first post will always contain the main list of available seeds (monthly updated). Click on the species name to see pictures and additional information. - Use private message when you have particular questions. - If your doubt can also be from others and increase the information about the fruits, trees, species, etc please feel free to comment as you like. - Give preference to the 'Reply' button instead of 'Quote' to avoid repetitions and overlays of images in the topic. - Tall tree with elongated shape (smaller diameter and bigger height), interesting for those who have little space in the yard. I found this tree in the final of fruit season, I did taste some fruits and was very sweet (better than Sabará in this first experience). I'm definitely going to monitor this tree next year. Fruits remain with "rajado" colour even after fallen from the trees. Sweet fruits, one of those when we start eating the fruit it's hard to stop. Perfect for those who want to attract and observe birds. Few seeds available, Helton said it possibly is Strychnos tomentosa, but I'm not sure. A vine plant growing on other trees, the fruits have a good attractive sweet smell, but to me the taste was not very interesting (sweet at first, but a slight bitter taste together). A plant for collectors and curious people. A botanist friend said it is a variety of Psidium guineense with bigger fruits and leaves and Helton think it could be Psidium grandifolium, so I'm not sure about species id. What I can say is that fruit taste is much better than common Psidium guineense in my opinion. Taste is similar to Psidium eugeniaefolia, juicy, aromatic, sweet and slightly acidic. The fruits remain green when ripe. I found only two individuals in the region and both have a lying growth habit. I fell in love with this fruit. When the fruit stays longer in the plant (very mature) the taste gets a lot better. The taste of the juice reminds me of apple+melon. Very aromatic fruit. I intend to send Acnistus arborescens (very small seeds) as camouflaged in the middle of papers so the freight cost of this species will be lower (USD 3). I'll make my first attempt next week. I'm not sure what species/variety is this, so "Taquaril" is its name for now. Only a reference to the locality where I found it. Local people call it 'jabuticaba-do-mato" (wild jabuticaba). Not so many fruits on the tree, it was final fruiting season when I found it. Despite being wild, it tastes deliciously sweet, on the same level as Sabara variety. The fruits have persistent sepals and a slightly velvety appearance. A tree overview video here. For those who want to follow and don't miss the new seed offerings, please save this thread on your bookmarks threads list. Tree have lobed leaves, very beautiful and elegant. Fruit with sweet smell, very pleasant aroma. Taste is very particular, I have difficult to describe it, but let's try: Slightly sweet pulp with absolutely no acidity, the taste reminds me date palm or dried fruits, something reminds me the taste of coffee or coke. It seems to me that in Brazil this fruit is unknown, different from its relative Genipa americana that is quite popularly used for liqueurs, drinks, candies. I prepared a juice macerating the pulp with a little water and sugar and I liked the taste a lot. I haven't tasted the Genipa americana yet but Helton says on his page that Genipa infundibuliformis has a nicer flavor than Genipa americana. I got a plenty of Myrciaria glazioviana fruits this year, so I would like to offer a better price. 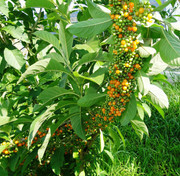 A climbing plant, fruits have very good smell and taste similar to sweet passifloras. A very curious plant to beautify the yard. Works fine. Seeds were delivered in Florida perfectly. 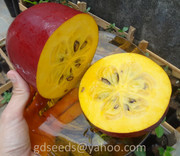 I can also try to send Solanum alternopinatum seeds per USD 3 shipment value. Low acidity variety, perfectly possible to eat many fruits in-natura without making ugly face. Several seeds germinated so I recommend not to be late in ordering. I can send pre-germinated or not germinated seeds as you prefer. 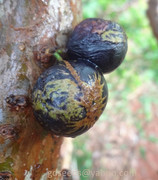 Fruits collected from a wild tree located in an area of preserved Atlantic Forest. I've seen people talking about selected varieties of this species, but I believe it's just a matter of strong fertilization, irrigation, and cultural dealings to get rich, beautiful fruits. I agree with what was said about the taste, it is even delicious. More information about taste of this species here. According to Helton (Colecionando frutas) it is Strychnos tomentosa, a species he had been searching for a long time. It was my contribution to his fruit collection.